Rand McNally | The Best Wine Country Vacations in the U.S.
Blog Home The Best Wine Country Vacations in the U.S.
Every bottle of wine tells a story. When you sip on a glass of wine, you can taste the region from which it came — the rich history, culture, climate, and ingenuity. Yes, you can pick up a bottle at the store, but nothing compares to the experience of visiting a vineyard, talking to winemakers, and really getting to know the vino that you are drinking. While there are wine destinations all over the country, these are our top ones to visit. The Monticello Wine Trail consists of 33 wineries around the Charlottesville area, and is considered the Birthplace of American Wine. President Thomas Jefferson had a vision to plant thousands of vines on the land around his estate and produce quality wines that rivaled those of Europe. Though his dream of creating wine never came to fruition, the eastern slopes of the Blue Ridge Mountains and the rolling hills of the countryside offer stunning topography and have made this a hotspot for generations of winemakers that came after him. Fertile, granite-based clay soil has earned Virginia an international reputation for its Cabernet Franc. This flavorful, peppery, and oaky red wine pairs well with red meat and cheeses such as aged Gouda and Gorgonzola. When Jefferson initially wanted to establish a vineyard, he chose the land between Monticello and Ash-Lawn, which is where present day Jefferson Vineyards now stands. Enjoy tasting award-winning wines that contain no additives or concentrates on a sprawling deck that overlooks the mountains. The vineyard tries to stay true to our third President’s original values of clean and beautiful wines. Considered by many as the wine industry’s Wild West, Paso Robles is California’s fastest growing American Viticultural Area (AVA). Since the year 2000, the number of wineries has grown from 50 to 200. Flat river flood plains are dotted with quaint wineries that produce plush, sweet-fruited red wines. Hot days and cool nights make ideal growing conditions for more than 40 varietals of wine, but the ones to look out for are the Zinfandels, Cabernet Sauvignons, and Rhône-style blends. In 1797, Spanish and Franciscan missionaries introduced wine grapes to Pasa Robles, and in 1982, Epoch Estate Wines was established as the first winery in the area — which is worth a visit just for the history. While you’re in town, we also recommend checking out JUSTIN Winery, which is one of the largest winemakers in the region and produces over 400,000 cases annually. Try their award-winning, full-bodied Bordeaux-style wines. If you are a Pinot Noir fan, then the Willamette Valley in Oregon is the place for you. Yamhill County, located in the northern end of the Valley, is home to over 80 wineries — which is about one winery per 8.9 square miles — and has the third highest concentration of wineries of any US counties. Yamhill was the final destination for many Oregon Trail pioneers, and is now being revitalized by a new wave of pioneers: winemakers. The mild, cool, and moist climate is ideal for growing Pinot Noir grapes, making it one of the most influential wine regions in the country. The wines are known for having hints of black cherry and Dr. Pepper aromas and flavors. Home to one Oregon’s oldest tasting rooms is Sokol Blosser winery, and is host to a constant stream of visitors. The vineyard sits on 85 acres of land and emphasizes sustainability when it comes to every aspect of its business — even offering electric car charging stations out front! Also stop by the peaceful Fairsing Vineyard for beautiful wines and infinite views of the surrounding Willamette Valley and peaks from the Cascades to the Coastal Mountain Ranges. Napa is basically synonymous with wine, and is one of the most popular destinations in the world for wine enthusiasts. Napa County has more than 400 wineries, the highest concentration of any county in America. 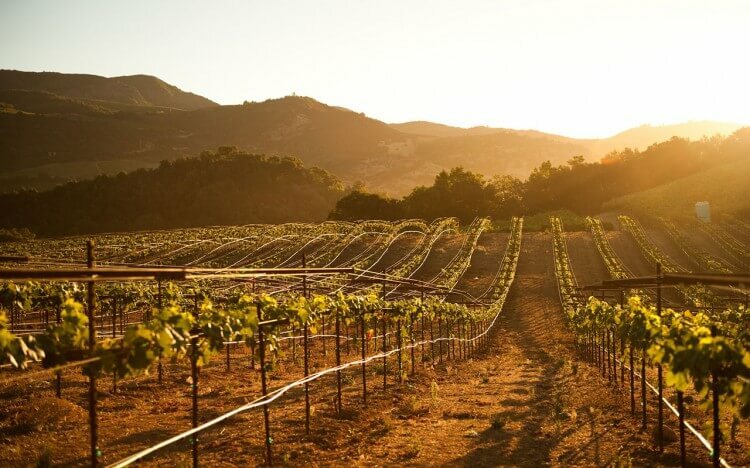 Because of the area’s diverse soils, climate, and topography, Napa Valley vintners are able to produce a wide-range of internationally-acclaimed wines. Stunning natural vistas and scenes aside, Napa is known for its full-bodied Cabernets, fruity Merlots, and buttery Chardonnays. So grab yourself a glass, and pay a visit to some of our favorite wineries. One of Napa’s most popular wineries is V. Sattui Winery, which has been in business since 1885 and consistently produces award-winning wines. V. Satti Winery has three tasting rooms and friendly, knowledgeable consultants to guide you through their wines. Castello di Amorosa is easily one of the most beautiful vineyards in Napa, with the winery situated in a one-of-a-kind Tuscan-style castle. It has 24,000 square feet of caves for barrel aging and an expansive 83-acre property where you can enjoy tastings, as well as tours through the castle. Located in the Finger Lakes region of New York, Watkins Glen is one of the premier cool-climate wine-making areas in the world. The village sits on the banks of Seneca Lake, which is home to more wineries than any of the other Finger Lakes, many of which are part of the Seneca Wine Trail. The combination of Seneca Lake's deep sapphire waters and rolling hillsides makes it an ideal microclimate to create award-winning Reislings and the area's signature ice wines. Some vineyards leave grapes on the vine into the fall and winter months allowing them to freeze, thus raising the sugar content to create the sweet ice wine. One of the more popular wineries in the area is Fox Run Vineyards, which offers beautiful views of the lake from its tasting room, friendly staff, a commitment to protecting the ecosystem of the lake, and, of course, their balanced and flavorful wines. Another great spot to visit Herman J. Wiemer, one of America's top Riesling producers. The winery was founded by a German immigrant in the 1960s who helped establish the region now known for its Riesling identity. These wines are handcrafted and esteemed by the wine lovers around the country. When you think of the Lone Star State wine is not usually the first thing to come to mind. but Fredericksburg, Texas is quickly gaining a reputation for growing high-quality grapes and producing world-class, award-winning wines. The Texas Hill Country AVA is the second largest in the nation, and the combination of sun and soil creates a wine region reminiscent of those in central Italy and the Rhone Valley in France. Experience the Fredericksburg Wine Road 290, a group of Texas wineries located along US Highway 290, and enjoy wines, vines, and vistas. We recommend the popular 1851 Vineyards, located only 4.1 miles from historic Main Street. 1851 is an estate winery that was settled over a century ago as a flour mill. The winery is now family-owned and operated and is dedicated to great Texas wines such as Chardonnay, Albariño, and Petite Sirah, and charming Texas hospitality. For legendary wine, you’re going to want to take a trip to Sonoma, California. Stretching from the Pacific Coast to the Mayacamas Mountains, more than 60,000 acres of vineyards and 400 wineries are nestled within the borders of 18 American Viticultural Areas. The large diverse area ensures that there are plenty of wine varietals no matter what your palette prefers. Sonoma County wineries have won countless national and international awards and the area has become a winemaking powerhouse — particularly of Chardonnay, Pinot Noir, and Cabernet Sauvignon. For those interested in eco-friendly wine, Benziger Family Winery is a great choice. In 2000 the winery became biodynamic, which isthe highest level of organic certification. Here you can enjoy tastings as well as tours of the farm, where you can get up close and personal with the sheep who play a pivotal role and clear the land of weeds. A historic winery to visit is Hanzell Vineyards, known for its Pinot Noirs and Chardonnays. Hanzell is the first winery in the world to use temperature-controlled stainless steel tanks for fermentation, which can be tasted in their signature grapefruit-y Chardonnay.